There are things we do innately – check the time, read the news, breathe. For me on the road, it’s second nature to share ideas. Even though I lead a file sharing division (Syncplicity), I’m not the only one who thrives because of sharing, as I learned this week. By publishing its first Magic Quadrant for Enterprise File Synchronization and Sharing (EFSS), Gartner makes one thing clear: the ability to easily and securely share files in the workplace has become a modern day necessity. The report presents sound guidance for mapping EFSS to your own enterprise organization’s priorities. For EMC, this more frictionless way of working started after the Syncplicity acquisition in 2012. Then we made the leap to 60,000 EFSS users, sharing our lessons learned here. Over the past two years, we have packed in innovations based on enterprise customer feedback. The Syncplicity approach, as the report highlights, confirms a belief we’ve held since the beginning: design matters. Build an app that’s amazing to use, functionally and aesthetically, and uptake will occur organically. It takes functionality that meaningfully impacts all enterprise stakeholders for true ROI. And now in 2014, Gartner is tracking EFSS and has delivered the Magic Quadrant format to guide all of us on next steps. An ecosystem of file sharing market vendors, scrutinized annually by the likes of Gartner, will only further innovation and expedite this new way of mobile working. Enterprise File Synchronization and Sharing has arrived in the enterprise. Check out the full report. Mobility and Security Spark Innovation in File Sharing Today, But What Else Tomorrow? History keenly documents how the industrial age push for productivity eventually led to an innovative electric light bulb. That contained energy, in turn, vastly impacted how people worked, lived, traveled, and experienced our world. I don’t think it’s a far stretch today to look at work and personal lifestyle pressures that are prompting innovation in our content management space. Two trends in particular are at the forefront of our new Syncplicity release today – Enabling Mobile File Sharing and Protecting the Mobile, Enabled Users. The power, storage capabilities, and screen style of mobile devices has not only changed how people share content, but has catalyzed their motivation to share it. When it’s intuitive and touch enabled to share files with colleagues, the odds quickly improve to do it more often. As we’ve seen with the skyrocketing number and usage of consumer apps, offering a compelling, highly functional and well-designed interface builds volumes of users. Coming at mobility from a content management lens, the average worker today owns about 3-7 devices and constantly interacts with unstructured data, especially Office files. Mobility to them means intense travel schedules, a mix between personal and commercial on the same device, and time pressures forcing the need for significant productivity. They have little time to respect process, policy, or seemingly “intrusive” security controls. These dimensions of mobility have sparked innovation in our Syncplicity design principle. Make file sharing a simple, productive, and enhanced experience that makes users want to use it again and again. Use a cloud-delivery model to keep features comparable, if not better than, innovations in consumer apps, to ensure users consistently use it over time. And keep adding capabilities to shave off user time, worry, or frustration. But mobility cannot be viewed as a stand-alone pressure, else security risks will elevate together with usage. Just like electricity eventually spawned the need for circuit breakers that prevented fires, a powerful file sharing solution needs to address security concerns as well. While the free flow of files may thrill and delight end users, it may also alarm and disturb those charged with protecting an organization. Files may contain sensitive information provoking legal action, intellectual property, internal process instructions that can be exploited, and many other truly harmful types of content if fallen into the wrong hands. Together with innovation for mobile users, the latest Syncplicity release equally builds in several powerful security capabilities for IT professionals. Set policy across files. Graduate the levels of protection based on the user’s geography, profile, or other parameters. Choose whether data resides in the cloud, in your private network, or in a hybrid environment. Thanks to the intuitive design that attracts users, IT can also set security policy across a single solution that’s happily and voluntarily used by the majority of stakeholders. Finally, user convenience is not at the expense of compliance, and security in fact enhances productivity rather than detracting from it. As I look at these two formerly opposing trends and see how we’ve woven innovation together to address them, I also think about what’s next. Now that users can safely share files around the world, will they create more of them? Now that we have the broadest and safest levels of reach for content, will global knowledge and productivity rates rise? Once users get a taste of “awesome” secure apps in their enterprise, will that pressure HR benefit tools, Sales tools and other enterprise apps to improve as well? I welcome your comments on what impact Syncplicity innovations might have on your organization and your ecosystems of vendors, partners, and customers. Please share your thoughts below. As enterprise software moves into the world of Software-as-a-Service (SaaS) and consumer technology innovations invade the workplace, how companies evaluate enterprise software vendor changes dramatically in many way. Yet, in some ways, it remains the same. Gone are the days when IT could mandate software solutions with a less than stellar user experience. Today, users will go rogue and adopt consumer apps over enterprise-approved software if it makes them more productive and more mobile. Before you select an enterprise SaaS solution, put yourself in the users’ seat and compare the experience to leading consumer apps. Do they match up? If not, you better keep looking. For decades, enterprise software providers have jammed features into their products to meet every IT and user need. The mobile first, cloud-computing world is all about apps that do one thing really, really well. A portfolio of simple, elegant products that are easy to use and easy to implement makes more sense than a complex, comprehensive solution with a long roll-out time and a steep learning curve. The 18-month product release cycle is a thing of the past. Today’s users demand constant improvements to the way they work – without radical changes that require retraining or disrupt productivity. And you’ll find it’s a great advantage to have your vendor improve features without having to install any software updates. Ask your SaaS providers how they maintain their products with regular releases that streamline and bring the best to the top. What is their pace of innovation? One big change in enterprise software is the shift from perpetual licensing that hits capital expense budgets to subscription-based pricing that hits the operational expense budget. Software in the cloud requires no capital investment, expensive roll out or prolonged training. With relatively low initial investements, if a service doesn’t solve the problem or users don’t adopt it, cancel your subscription and move on. Because there are no huge upfront costs, SaaS vendors have to keep customers happy on an ongoing basis. Enterprises have no problem paying good money for software that delivers value, they just have a problem paying upfront for technology that they are not likely to use. And now, three fundamental ways your relationship with your vendor doesnot change. No matter how much digitization permeates our lives, people will continue to make large software or Software-as-a-Service purchases from people they know and trust. But this is a marathon, not a sprint. You need to partner with vendor in it for the long haul and are accountable beyond any one product or service. IT technology restrictions may not seem logical to users, but the need to mitigate risk and comply with requirements remains and enterprise reality. A SaaS provider may be highly secure and have a terrific consumer following, but if it doesn’t meet the compliance bar, it doesn’t belong in the enterprise. SaaS companies that cater to the consumer market often introduce new features by rolling them out to users even before they tell them. Enterprises need predictability and a transparency about upcoming changes. Updates may have important implications for security, compliance, compatibility and workflow. Make sure your SaaS vendors communicate proactively. Gone are the days when IT could mandate which tools were used where. People want to work as efficiently as possible, anywhere, on any device. That dramatically affects how enterprises choose and buy their software, but some things never change. 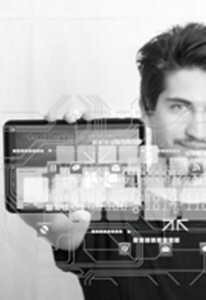 The BYOD movement continues to gain momentum. As such, consumer devices are invading the enterprise. This freedom is liberating for workers but potentially disastrous for IT. To combat the risks introduced by BYOD, IT has no choice but to arm themselves with enterprise-grade security and control to mitigate potential data leakage. Today, EMC is excited to announce Syncplicity Enterprise Edition (EE), an enterprise-scale, cloud-based file sharing solution that blends two ends of the spectrum — consumer usability with true enterprise security and control. Modern workers are well-connected, multitasking, “uber producers,” and IT needs to stay ahead of the pace. That’s what Syncplicity EE is all about – simplifying end user deployment and administration at enterprise scale, and empowering IT with complete control over security, policy and storage. Providing a Frictionless User Experience — Users are demanding easier access to files to get work done, as simple as downloading music to their devices. So why dance around the subject when you can put a stop to Shadow IT? Syncplicity EE does this. Empowering IT to “manage the unmanageable” — Having the ability to configure the system to align with their security approach, establish policies and deploy at scale empowers IT to provide users flexibility without losing control. Giving Storage Choice — Provides IT storage options that enable organizations to manage files in a way that complies with their security, compliance, data availability/protection, and data residency requirements without impacting the user experience. Syncplicity EE gives IT choice of storage, either in the cloud or using an on-premise storage infrastructure based on EMC Isilon scale-out NAS or EMC Atmos object-based cloud storage. Unlike other services that tout on-premise storage, Syncplicity moves files directly from storage to devices — files are never cached nor passed through our cloud service. Data can also be replicated geographically so users worldwide are accessing files from the closest data center. Syncplicity supports single sign on (SSO) with Active Directory or any SAML-based authentication service, and two-factor authentication. IT can also enforce levels of authentication based on location or IP address. For example, a user may only need to sign-on via Active Directory by default, but require two-factor authentication when traveling to countries where there’s higher risk. In addition, the new offering includes Syncplicity Connector for EMC Documentum, enabling content to be synced and distributed to large groups of users, across all devices, inside and outside the firewall. Organizations can share sensitive information extending enterprise reach without compromising security. This is huge, particularly for highly-regulated industries where access to the most current information securely is paramount and brings Syncplicity into the fabric of an organization’s critical business process. As you see, Syncplicity EE provides IT greater control over where potentially sensitive data is stored and how it’s shared, while still delivering increased productivity for users regardless of device or operating system. Knowing when and how to ensure the right level of security, compliance and scalability across the organization is key. Without proper IT support, users will continue to find alternative solutions — leaving IT in the dark. To learn more, register for a free trial of Syncplicity EE. 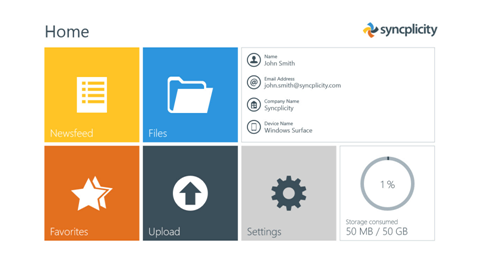 On March 6, we announced the Syncplicity App for Windows Phone 8 and Windows 8 New UI for Windows 8 devices. We’re excited to say they are now both available for download. Check it out! By now, it is abundantly clear that the old world of enterprise software is changing materially. The problem is well known by all who have spent any time in corporate IT: enterprise software has become too complex to deploy and use. As we move into delivering software-as-a-service, several fundamental assumptions made with enterprise software are no longer valid. An entirely new set of assumptions must be followed to achieve success. Below are three cardinal rules of SaaS. I like to call them the “ABC”s. SaaS changes the business model for technology providers as the the customer gets to pay by the drip. If you don’t use services, don’t pay for them. If there isn’t adoption, the technology provider won’t make a profit. The sooner that IT departments and technology providers accept this reality about SaaS, the sooner the users start to benefit. The first step of adoption is activating the user base and enabling them to use the service, which should be just as easy for enterprise software as it is with consumer services like Facebook. The second step is engagement. It is in the vendor and the customer’s mutual interest to drive user-engagement to garner sustained value from the service purchased. 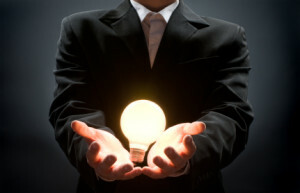 Therefore, incentives must be in the DNA of the service to ensure they stay engaged. Next comes penetration to a broad user base, where network effects are a critical contributor of success and more value or productivity is driven from the usage of the service, followed by sustained usage, which is how providers make money. If and only if the first four occur will the vendor have earned the right to a reference, which creates more energy in the project, and a new wave of users who want to try it. The second essential ingredient of a successful SaaS implementation is continuous monitoring and behavioral analysis on how the service gets used. SaaS behavioral usage instrumentation and analysis will be one of the most talked about Big Data applications in the next three to five years. Enterprise software is ridden with complexity. Complexity deters adoption. And as we just discussed, lack of adoption is lack of success in SaaS for both the buyer and seller. While this concept is intuitive, few software outfits have a way of knowing quantitatively whether the millions they spent on building features are actually getting utilized. When it comes to SaaS, success is predicated on the technology being consumable. Return on investment for a feature is only meaningful when the feature is used, not when it is made available. This is why behavioral analysis of usage patterns is extremely important. De-featuring is as important an exercise as building features in the SaaS world. Simplicity must trump functionality. The third and most important aspect of ensuring success in SaaS is that neither the technology provider nor IT win if the user doesn’t win. In any successful SaaS company, one of the most important roles that should work directly for the CEO is the “Customer Success Officer”. Luckily, the SaaS business model is built in such a way that the technology provider only succeeds when the customer is satisfied. Start with small pilots, show user value, expand user base, and repeat. The customer succeeds when there is sustained user engagement. Day one of a software sale in the SaaS world is no longer a profitable venture for the vendor. Rather, when customers get broad usage and continue to derive value by the use of the service, profitability kicks in for the technology provider. Don’t doubt it, the world of software will be completely transformed with SaaS. To survive, remember these simple guidelines. Check out my interview with Chris Preston for a brief overview of IIG’s approach to Sharepoint. I explain opportunities for maximizing Sharepoint investments, and how Syncplicity provides a superior approach to syncing, sharing (accessing) and collaborating on business content.